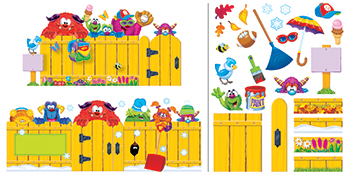 Display this fence with the appropriate seasonal base pieces, and then add the 10 separate Furry Friends™ with their seasonal accessories. Gate opens and closes. A fun way to learn seasons, showcase work, and display subjects. Fence adjusts to 64" wide. 81 pieces.